One of those dishes that was even better than expected.We served this with lamb chops with seven spices but it would make a nice mezze dish or a side for any grilled fish or meat. Heat the oven to 200ºC/Fan 180ºC/Gas 6. Put the tomatoes on a baking tray, drizzle with 1 tbsp of the oil and season with salt and pepper. Bake for about 20 minutes or until soft. Pour the vegetable stock into a small saucepan and bring to the boil. Add the couscous and simmer for about 10 minutes or until tender (check it as it may not take the full 10 minutes). Strain, tip into a bowl and add the chickpeas. Heat the rest of the oil in a frying pan, add the onion, and cook over a low heat for 5 minutes or until soft. Stir in the spices and cook for another minute. 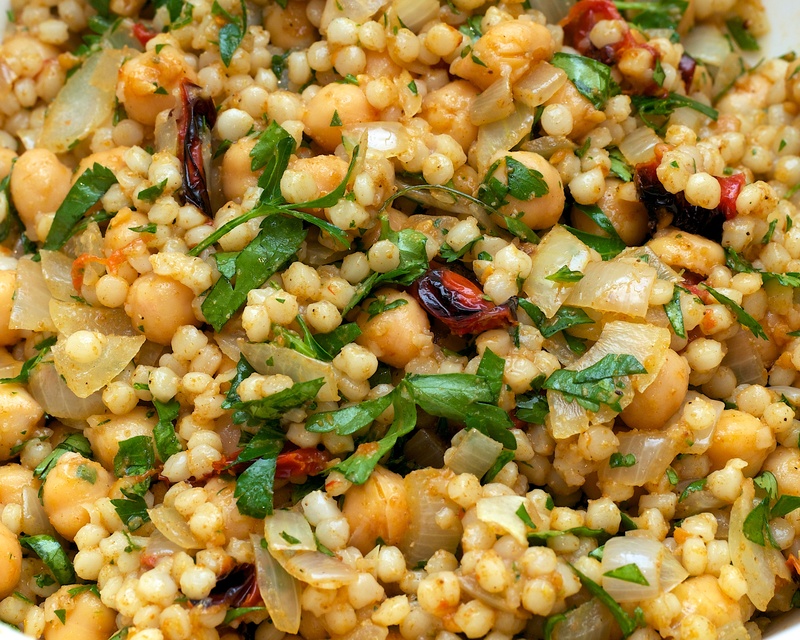 Remove from the heat and stir the spiced onion into the couscous and chickpea mixture. Add the coriander, parsley, and roasted tomatoes, and season well with salt and pepper and a squeeze of lemon. This sounds delicious, can’t wait to try it!